Grab a bottle of wine (or your booze of choice) and set yourself up with Shakespeare's Sonnets. This game will be most enjoyable when played with others. Feel free to exclude rules if you feel they are too much to handle, unreasonable, or just`too alcoholic. Be prepared to read. This is a vocal drinking game. Out loud, begin reading one of Shakespeare's sonnets to your company. The process of reading the poems aloud in proper iambic pentameter and with gusto is crucial to the game / the game's fun level. Read with heart, as Shakespeare intended, and let your consumption match your spoken vigor. Shakespeare has been coined as the inventor of the contraction. In homage to this fact, drink every time he uses one in his works. Often in his works, Shakespeare will butcher the English Language to properly rhyme. Every time he does so, take a drink. This will, of course, begin to happen more frequently as the game progresses. Messing up includes both the mispronunciation of words and botching the iambic pentameter. 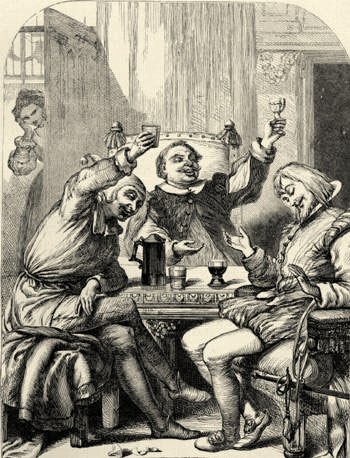 In celebration to have had completed reading the Sonnet aloud, take a hearty drink. It's no secret fact that Shakespeare often wrote about his love. Drink every time his love goes beyond the emotion and his work treads into more lewd grounds. This drink should be accompanied by a "Hah!" or a "Hear Here!" to exemplify the nature of which you are drinking to. Be it flowers, forests, seas, or the sky itself, if he writes of it, you drink to it. Please drink responsibly, have fun, and enjoy! I love this, I am reading this in your voice. If anyone does this via hangout, please let me know how it goes & extend the invitation! It would be equally as awesome if you recorded the hangout. I will gladly watch! AWESOME! Shakespeare is one of those people in history I would love to hang out with and get totally bombed! Most definitely! Thank you for the feedback! I'm working on more drinking games for other famous authors. Let me know if there are any specific authors, writing passages, stories, or poems that you would like to see a drinking game for!